Luke Langholz Pottery: Sick day, blergh. Well, between a puppy that hasn't been particularly cooperative in the sleep department and the lingering wintery weather, I've found myself in a less than stellar condition. So the sick day is where I'm at. Thought I'd pop in between naps and share what's been happening in the studio over the weekend (I'll give you a hint - it involves throwing!). Sunday I did get around to some throwing, but first I did a lot of trimming and associated work with the pots thrown last weekend. The pot immediately below (left) was taller to begin with, but had started to dry/settle unevenly, and so it needed to be pruned and corrected. That's a rather disappointing part of the process, and one that I do try to avoid, but sometimes trimming a bit off the top is more productive than spending an inordinate amount of time fiddling with correction. 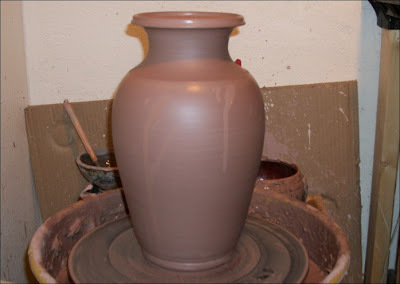 So, lefty vase could have been a few inches taller, but I'll settle for this with this one. Some of last weekend's pots - they've been trimmed, etc. More from last sunday - trimmed, etc. Pot above-left was still a little too soft (wet) to keep trimming on Sunday, so I did have to hold off until last night to finish it up. Also did a little throwing on Sunday. But just a little. Here's the little throwing I did Sunday afternoon. I like it. Finished trimming up this biggy. May try to bring the foot in just a little big smaller if it will let me. Another little vase. This one's going to require a significant bit of trimming around the foot, and a little more general shaping, too. But otherwise I'm still feeling pretty good about it. I guess that's it. I've got a couple of bigger personal studio projects coming up so my throwing should be more regular, even if the posting here stays irregular. Back to my puppy, my napping, and three seasons worth of "Monster Quest" streaming on Netflix. Stay awesome, readers. Thank you for follow my blog, it´s a honor. 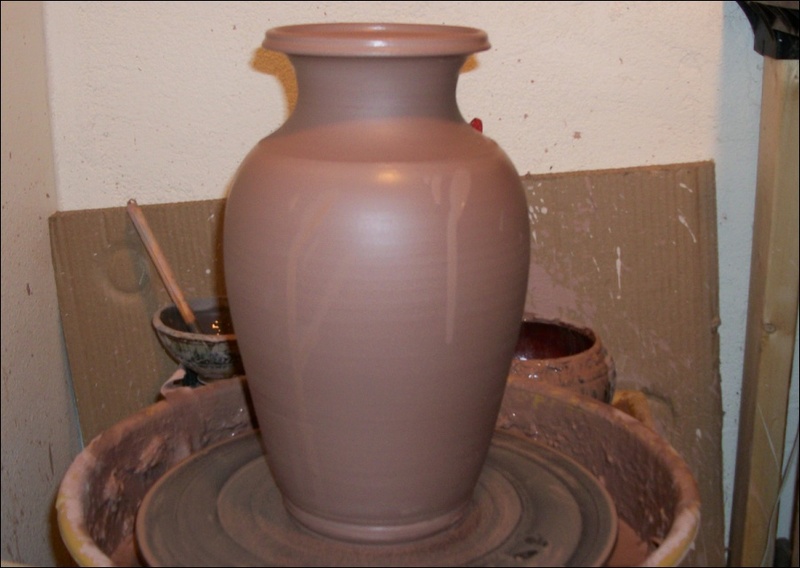 You have a great pottery work! Greetings from Brazil! Thank you - I enjoy your work as well! Believe it or not, there are actually pots of my creation IN Brazil! I was commissioned by a college professor of mine who is from Brazil to make several sets of mugs for her family still living there! All the best - I look forward to seeing more of your pots! I made some vases, listened to some tunes. New pots, throwing, and a helper in the studio.